Ben Roethlisberger plays as a quarterback for the Pittsburgh Steelers of the National Football League (NFL). Since his NFL draft in 2004, Roethlisberger has proved himself in so many ways by making his presence duly felt in different teams where he has played. He has also garnered a lot of recognition and accolades in his playing career. This includes the prestigious AP NFL Offensive Rookie of the Year Award in 2004, which was the same year he was drafted. There is so much more to know about the NFL player apart from his professional career. Here are lesser known facts about Ben Roethlisberger. He was born on March 2, 1982, to his parents; Ida Jane (née Foust), his mother and Kenneth Todd “Ken” Roethlisberger, his father in Lima, Ohio. Ben started at a very young age to exhibit an inclination towards the game of football. But it is important to note that Roethlisberger was a four-sport star back in Findlay High School where he attended. He served as a captain of his school’s basketball, football, and baseball teams. Gradually tilting towards football, he played as a wide receiver for the team. After a successful high school stint, Ben proceeded to the Miami University in Oxford, Ohio in 2000 and joined the Miami RedHawks football team. However, he was redshirted in his first season but joined fully in 2001 debuting with 2 touchdowns in the game against Michigan. At the end of his freshman season, he recorded 43,105 passing yards, 241 completions, and 25 touchdowns. His sophomore season was even better, Ben recorded an impressive 3,238 passing yards and 271 completions at the end of that season and also won the MAC East Special Teams Player of the Week. His junior season started with the RedHawks’ 49-28 victory over Louisville in the 2003 GMAC Bowl, and the team’s feat of peaking at No. 10 in the Associated Press poll. At the end of his junior season in 2003, he had recorded 343 completions, 4,486 passng yards, and 37 touchdowns. He also earned the title of MAC Offensive Player of the Year. With an impressive record from his junior season, it was predicted that Ben Roethlisberger would be drafted quite early. The predictions indeed came to pass as the talented player was selected in the 2004 NFL draft alongside Philip Rivers, Eli Manning, and J.P. Losman. It was a first round selection by the Pittsburgh Steelers at the 2004 NFL Draft. Following the draft, he signed a six-year $22.26 million contract with the team. Ben Roethlisberger had one of his biggest games in his first season with the Steelers in October 2004 when he led the team to a 34-20 victory over New England Patriots who at the time were still undefeated. In the 2006 season, Ben sustained an injury from a motorcycle crash and this caused him to miss the opening game of that season. Although his performance was affected initially, he finished off the season with a good record. Ben finished off 2008 season with 21 of 30 for 256 yards, one interception, and one touchdown, and in 2010, he made his third Super Bowl appearance. He finished Super Bowl XLV with 25/40 for 263 yards, 2 touchdowns, and 2 interceptions. Roethlisberger has been with the Steelers for over 12 years and has not been traded to any other team. His 2017 feat included an impressive record of being the 8th quarterback to reach 50,000 career passing yards. Being in the NFL since 2004, Ben Roethlisberger has accumulated so much wealth from his time with the Steelers. The talented NFL player sits on an estimated net worth of $70 million. Ben’s career earnings over the years amount to over $187 million, pushing him to the 9th position of active NFL players. In 2017 alone, the Steelers quarterback earned $18.2 million which ranked as 11th overall in the NFL. Roethlisberger is one of the highest paid players in Pittsburgh Steelers with a cap hit of $23.2 million. He may seem so entangled with his professional career but Ben like his counterparts also has a love life. He is married to his wife Ashley Harlan, a physician assistant from Pennsylvania. The couple tied the knot in July 2011 in the presence of family and friends. 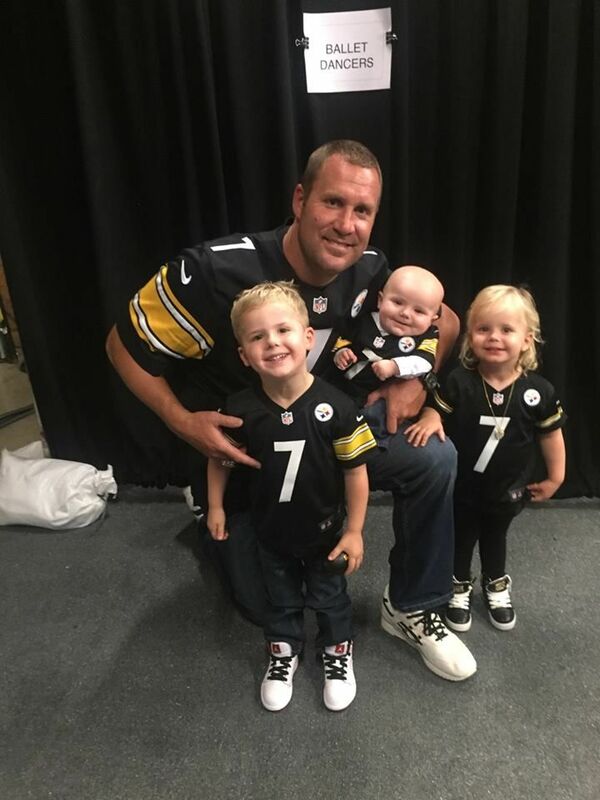 Together, they have three kids; Benjamin Todd Roethlisberger Jr, their first son who was born in 2012, Baylee Roethlisberger, their daughter born in 2014, and their second son, Bodie Hunter, born in 2016. Ben Roethlisberger is of American nationality but of Swiss descent. He has his origin traced to Geissbuhi located in the Lauperswil municipality in Switzerland. His Swiss ties made him become a spokesperson for the Swiss Roots campaign which is aimed at helping Americans of Swiss descent trace their ancestral heritage. Ben has an eye for business even though he seems so busy with his football career. The NFL player is an owner of his own line of barbecue sauce named Big Ben’s BBQ. In the 2010 season, Roethlisberger was suspended by the NFL without pay for four games, after he was said to have violated the NFL’s personal conduct policy. This came in the wake of a sexual assault charge against the NFL player.